This article focuses on the potential health hazards related to the consumption of dried yak meat, a favourite traditional food and snack of Tibetans. Traditionally freeze or air dried, nowadays dried meat also comes ready made and packaged in shops. 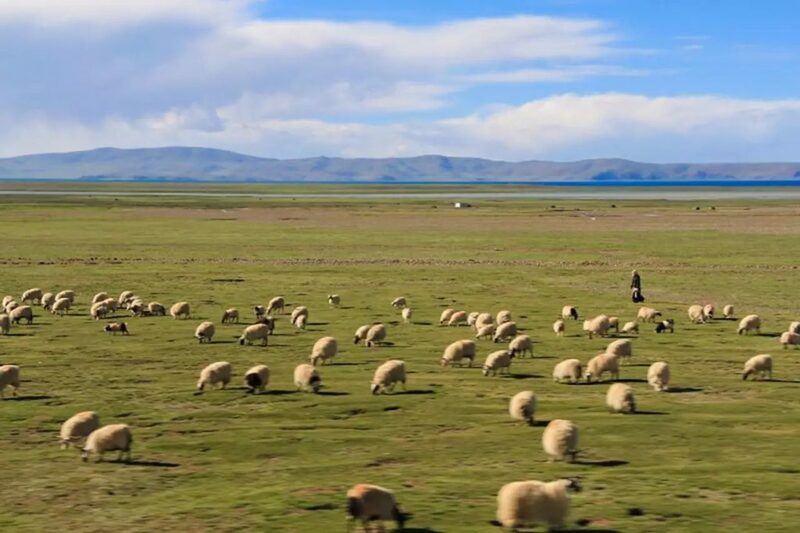 At the end of 2017, state media reported that out of around 3 million people screened in Tibet Autonomous Region, 30,000 cases of echinococcosis had been found. This article makes a case for increased awareness of basic sanitation and certain preventative measures. Thank you to Palden Gyal for the translation from Chinese to English. In pastoral communities like Nagchu and so forth, there is a custom of eating raw yak meat. As a matter of fact, it is not because they are blood-thirsty or somehow addicted to meat eating. It is because fresh yak meat can quickly become frozen in the bitterly cold and frigid climatic condition, and thus it is fitting and favorable for preservation yet also highly convenient as a comestible. The popularity of appetite for air-dried meat quickly escalated the demand for raw meat. It is the much-desired means and manner of eating raw meat. Utilising the cold and dry air to evaporate the moisture content of raw meat, a piece of meat-fibre devoid of any moisture content becomes very brittle and delicate to consume yet not easily perishable. Theoretically, as a result of raw meat not having undergone sterilisation under high temperature, it is possible to suffer from certain parasitic diseases or parasitosis when people consume it. 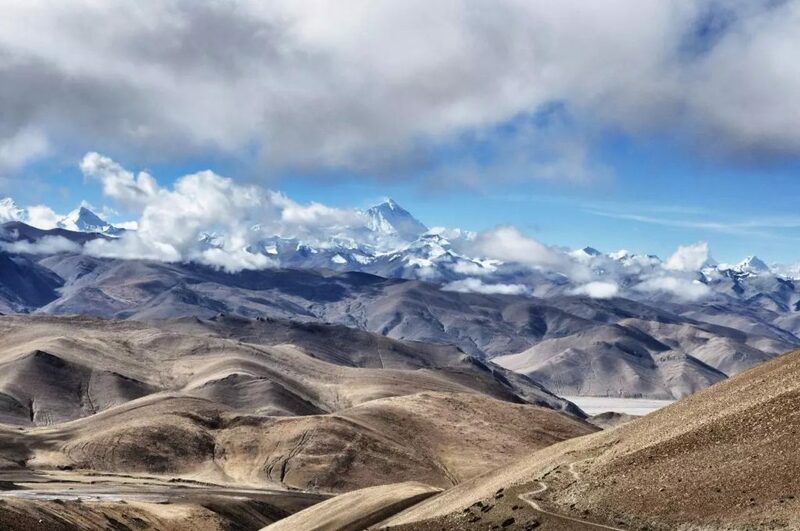 The most common parasitic disease is echinococcosis, and in 2010 alone, this particular disease claimed the life of around 1200 individuals in Tibet. If that is the situation, has or hasn’t the Tibetans, from time immemorial, been at “risk” by consuming such a hazardous food? Echinococcosis, also known as hydatidosis, is a type of parasitic disease that is prevalent in pastoralist communities. Although many people are aware of this disease, most people do not understand the cause and communication of this infectious disease. The liver is the most commonly affected human organ of cystic echinococcosis; other organs can also be affected, for example, lung and brain echinococcosis etc. 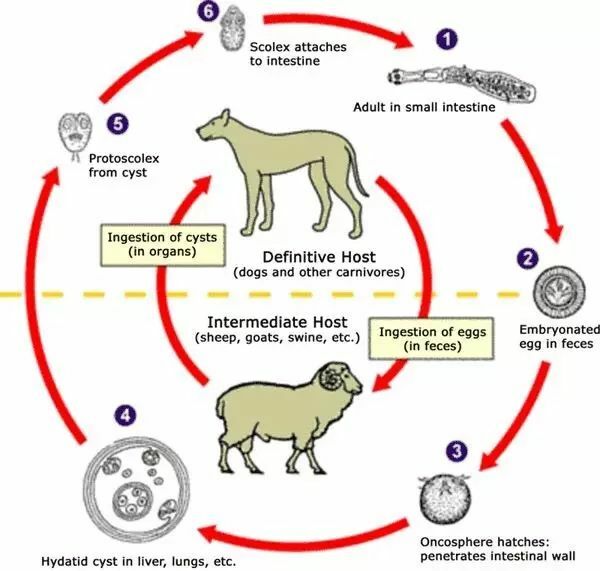 Direct transmission of such infections occurs as a result of close contact with dogs whose skin and fur are often infested with insect larvae, thus when people touch it they get infected. If dog droppings that contain insect larvae end up contaminating vegetables or drinking water, especially, when people drink water from the same source as livestock, it also brings about infection indirectly. The extensive pastoral lands of Central Asia are the breeding grounds of echinococcosis in the world. The maturity of echinococcus tapeworm occurs parasitically in the bodies of dogs, cats and so forth. Furthermore, with the discharge of excrement, livestock on pastoral lands consume or come in contact with such infectious droppings, and this makes nomads highly susceptible to such zoonotic diseases and pests. Echinococcosis is a type of infectious disease that hardly shows its signs and symptoms at its early stage. The cases of diagnosing echinococcosis at their early stage could only happen, incidentally, during general physical examinations. 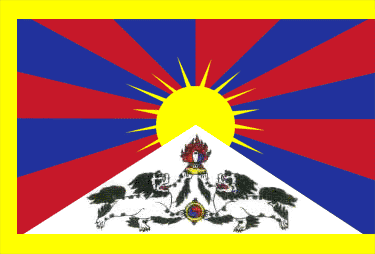 However, as a result of the low public health consciousness in Tibetan regions in general, the odds of discovering the infection at early stage are relatively low. Even those discovered after seeking medical advice or seeing a doctor they mostly happen to be already at their later stages. Now, although the diagnoses of echinococcosis mostly happen at later stages, the parasitic tumors of echinococcosis are benign. It is curable. 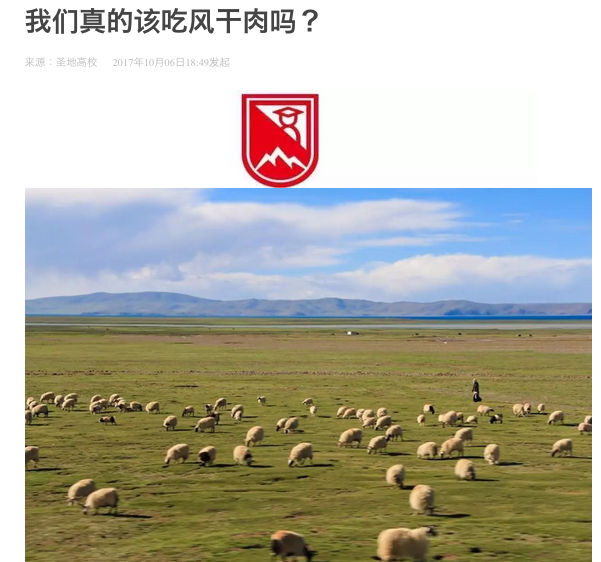 To come back to air-dried meat, doesn’t air-dried meat that is consumed and craved in Tibetan and Mongolian regions have the potential to be a hazardous food? As a matter of fact, very few would get sick from snacking on air-dried meat, and especially, the yak meat that is thoroughly dried in the cold air of the plateau would certainly not predispose anyone to aliments. We can confirm this certainty from our personal experiences. 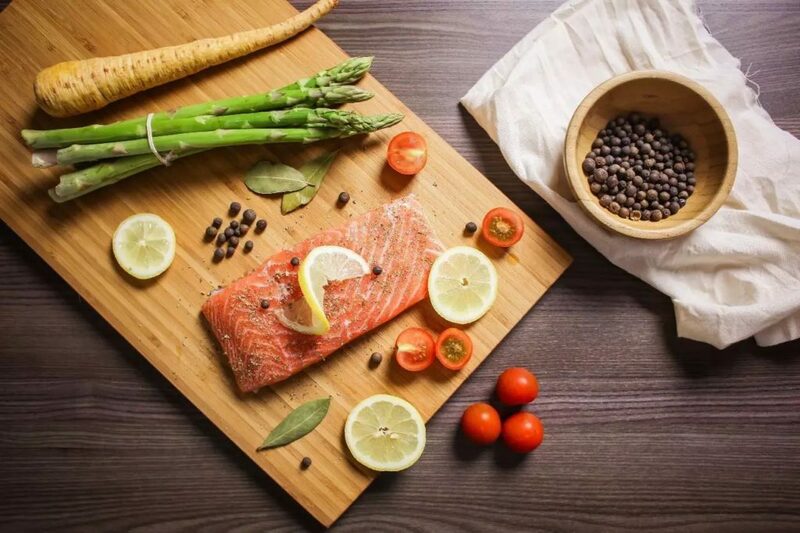 As for the issue of consuming frozen raw meat that is noted at the beginning of this article, experts maintain that currently scientific studies are yet to reach a decisive conclusion on the matter. As a result, we can feel relieved and keep on indulging in air-dried yak meat. In the Tibetan nomadic regions, hearsay has it that, performing surgical operations on cystic echinococcosis is one of the easiest tasks that even novice doctors can carry out, but in translating the [technical] terminologies, one comes to see translations such as, “echinococcosis – deadly cancerous insect,” and so on, in such shocking phrases. In that case, what brings about such nearly extreme situations into sight after all? 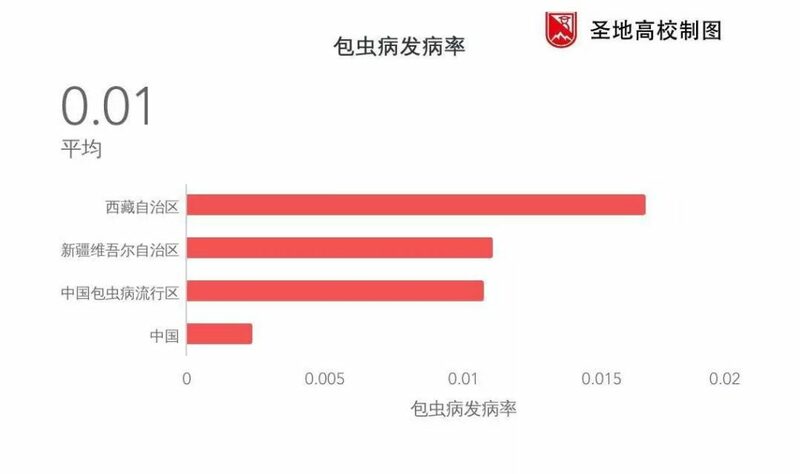 In China, the rate of mortality of echinococcusis is 0.24%; it would be even lower if we just restrict the measure to the Mainland. But, in 2012, a study of four counties selected at random and screened for echinococcusis gives a rate of 4.23%. According to the results of a large-scale study and screening in 2016, echinococcusis afflicts all counties as a phenomenon of increasing public health concern. The study indicates that the rate of mortality of echinococcusis in these places is 1.66%; still, the average in the hinterland far exceeds the national mean. For that reason, since it is a pernicious and prevalent disease in Tibet Autonomous Region (TAR), and especially in Nagchu, the medical experience and facility for treating cystic echinococcusis is abundant in these regions. The operation of the most common alveolar echinococcosis is considered a simple surgical procedure. However, in the coastal regions, such simple procedures of opening up cystic echinococcosis are considered quite challenging. In order to set up an effective system for the prevention, treatment and managing of echinococcosis, we can learn from and refer to the experience of the West. In their fight against cystic echinococcosis, the methods and measures taken up by Tasmania, the Australian state, include: intensifying inspection and supervision of slaughterhouses, destroying (by melting or burning) internal organs and carcasses of infected livestock, stopping domestic dogs from consuming internal organs or any part of infected livestock and thereby bringing insects that cause alveolar or polycystic echinococcosus, and additionally, by putting male dogs tested positive in quarantine.